There are a lot of differences between junior high schools in Japan and America. I have taught at four different junior high schools in three different cities in Japan. Besides the number of students, the schools have been very similar. Schools in Japan vary less than they do in the US. Schools can vary quite a bit in the US, and I only have experience with one, so not everything I say may be true for all American schools. But some things are still pretty standard. In America, the school year typically starts in August and ends in May or June. In Japan the school year begins in April and ends in March. They have about a month off for summer vacation in August, about two weeks in the winter, and another week or two between school years in the spring. Students often still have to go to school for club activities and have a lot of homework during their breaks. Middle school in America is usually grades 6 through 8. In Japan, it's grades 7 through 9 (called 1-3). High school is grades 10 to 12. Most students in America take school buses or are driven by their parents. Japaneses students walk or bike. There are no school buses and their parents aren't allowed to drive them to school. There are exceptions though, especially in rural areas. In Toi a few students were driven to school. I'm not sure, but I assumed that they lived far away on the winding mountain roads that were too dangerous to bike. At my junior high school this year there are quite a few students who live far away so there are a couple of "school buses." They're just regular city buses that come to the school and are used only by students at those times. Being able to walk or bike would have been great to me. I really really really hated the bus. It was definitely the worst part of middle school for me. Some schools in the U.S. have uniforms, but some don't. 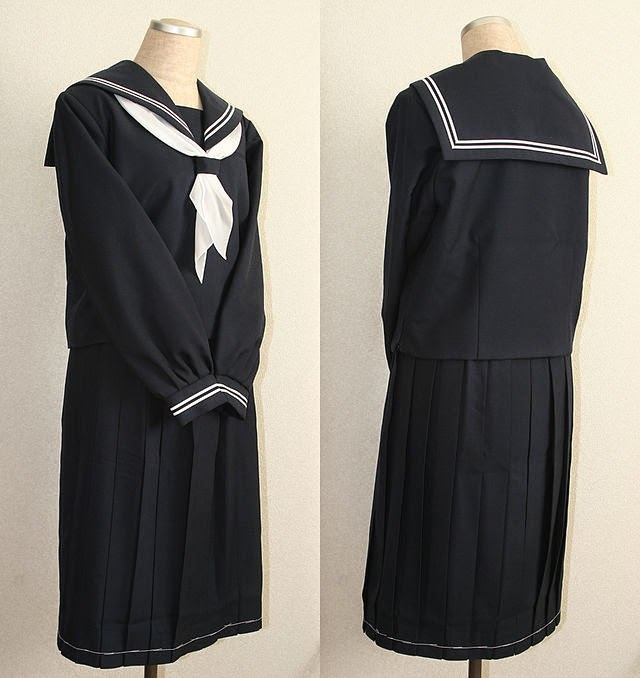 I've never heard of a Japanese junior high school without uniforms. They typically have both formal and informal uniforms. Students walk/bike to school in their formal uniforms and then change into their casual uniforms at school, which seems silly to me. Though in Toi I think they just went to school in their casual uniforms. They also wear the formal uniforms for special ceremonies and events and test days. The dress code is very strict. No makeup, nail polish, jewelry, or dyed hair. Girls with long hair must have it in a ponytail. Backpacks are uniform and can't have any extra stuff like keychains or charms. Umbrellas must be certain colors such as navy blue or black. There are similar rules for scarves and hats when they're allowed to wear them on their way to school. They can only wear them once the school decides it's cold enough. 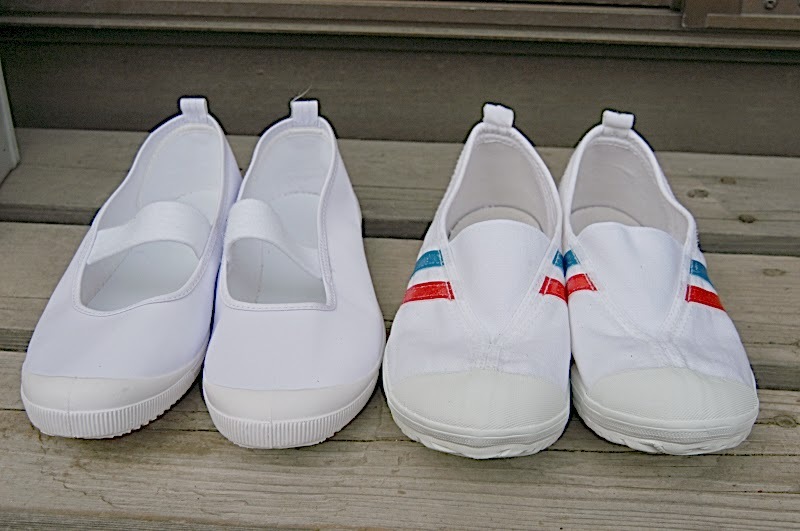 It's strange to me that schools can enforce what the kids can wear before they're even on school property. .
Japanese students change into indoor shoes when they arrive. They also often have separate gym shoes. I've never heard of an entrance ceremony in America. On the first day we just showed up at school and went to class like usual. Entrance ceremonies are a big deal in Japan. This year my school had a ceremony for the 2nd and 3rd grade students. New teachers introduced themselves, there were some boring speeches, and representatives from each grade were ceremoniously handed their textbooks. It was formal and serious, but parents didn't attend. There was also a much bigger ceremony for the 1st grade students. Parents and the upperclassmen attended. At my school some students played taiko drums as the new students walked in. They had to slowly walk to the front like walking down the aisle for a wedding. But the atmosphere was super serious. I only saw one student smile at that point. I don't remember too much else from the ceremony, but I'm sure there were plenty of long, boring speeches. My American middle school had a graduation ceremony, but not all do. It was attended by graduation students and their families. In Japan even the 1st and 2nd grade students attend to say farewell to the graduating students. In Japan, there are other random ceremonies throughout the year. My junior high school this year has one almost every Wednesday. Awards for sports and things are often handed out. Even these small ceremonies are very stiff and formal. There is polite clapping, but no cheering. The students all sit with their legs bent in front of them. Teachers go around and tell students to sit properly. I can understand that if a kid is sprawled out on the floor or something, but I don't see how sitting cross-legged bothers anyone. Every Japanese school has a song that is sung at ceremonies and other events. Students do a lot more singing than in America. Japanese students sing the school song, sing in music class, and participate in an annual chorus festival. 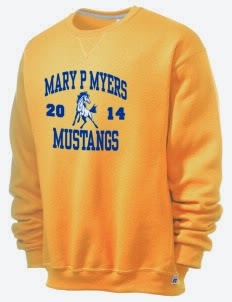 My middle school's mascot was a mustang and our colors were blue and gold. Picture from prepsportswear.com. American schools have mascots and school colors, but Japanese schools don't. This is surprising to me because cute mascots are popular in Japan. Many towns and cities have their own mascots. In America, teachers have their own rooms and students move from room to room. It's the opposite in Japan. Students stay in their homeroom classes and the teachers move. So students can keep their stuff in their classrooms and don't need lockers. Though the students do move for classes such as P.E., home economics, music, and science when they have lab stuff. Because of this, all teachers have desks in a staff room. Teachers in America can stay at one school for their entire career. 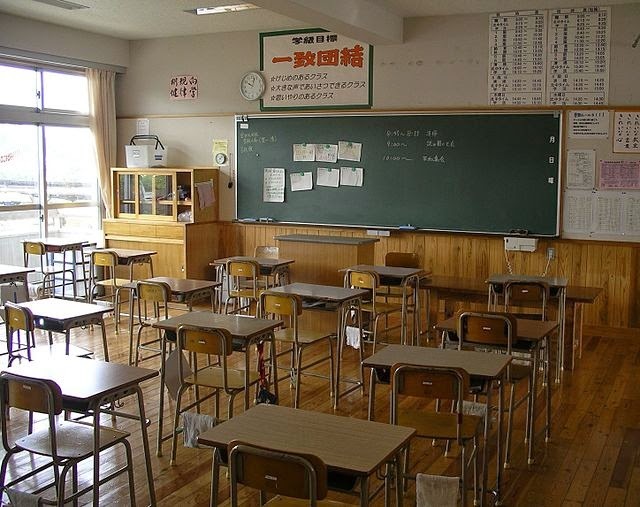 In Japan, teachers are forced to change schools every few years. My American middle school didn't have many windows. A lot of classrooms had none at all. I don't think any Japanese school would be that way. 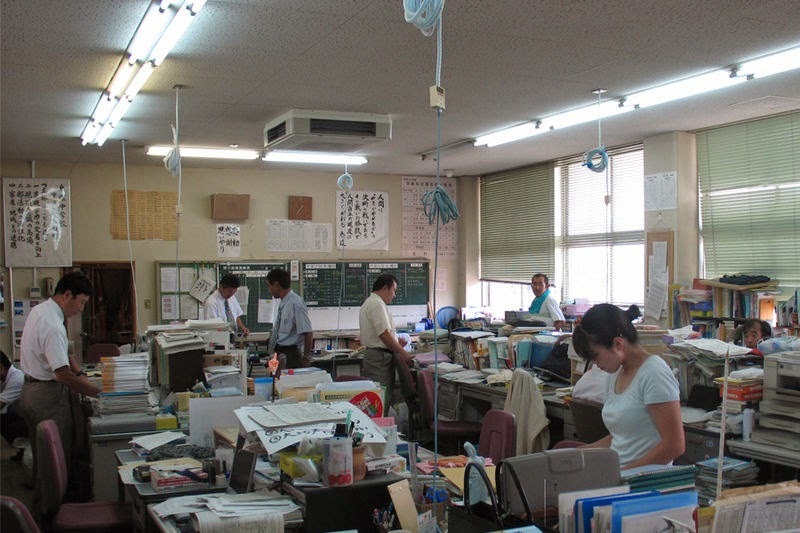 The overall layouts of Japanese schools vary, but the halls and classrooms are a certain way. There is a hallway with windows on one side and classrooms on the other. When you walk into a classroom there are windows on the opposite side and the chalkboard is on the right. Every single classroom I've been in has been this way. I've never even seen one with the front chalkboard on the left. There's a good reason for the specific layout because they don't have air conditioning. They can get a breeze with the hallway and classroom windows open. It still gets really hot though. What really drives me crazy is that they leave the windows open even in the winter because they believe it prevents the flu. There isn't insulation either so closing the windows wouldn't really make it that much warmer, but it would be better. In Hamamatsu it rarely goes below freezing, but it's still really cold. Students can wear layers under their uniforms, but jackets, hats, and gloves aren't allowed. They can't pull their sleeves over their hands either (I was slightly scolded for doing that). The schools can't do much about the heat, but I wish they would let the students (and me!) bundle up a bit more. People often think that Japan has a bunch of futuristic technology but it's not that way. Computers are rarely used in the classroom (though Jonathan says they're used quite often at his school). I've never seen a computer in a classroom unless a teacher brings in a laptop. I've never seen a student type a paper either. Though I wonder if that's partly because they're still learning to write kanji. At my middle school in America we had six classes a day and had the same schedule every day. Schedules vary some in the U.S. of course though. In Japan the day begins and ends with homeroom and there are six periods in between. They don't have every subject every day. Most main subjects are studied three or four days a week. The periods vary every day. For example, a class might have English 1st period on Mondays, 5th period on Tuesdays, 3rd period on Wednesdays, no English on Thursdays, and 6th period on Fridays. Students at my school study math, science, English, social studies, Japanese, P.E., music, art, moral education, shop class, and home economics. They also have something that the textbook translates as "period for integrated study." I'm not sure what that is. They have it once or twice a week. I think it's a good system because it allows them to study more subjects and every day isn't exactly the same. Plus, they won't be sleepy during the same subject every morning. At my U.S. middle school we had one elective class. We could choose orchestra, band, chorus, or P.E. I chose orchestra, so I never had to take P.E. Junior high students in Japan don't have electives. All students take all subjects including music and P.E. In music class they sing, play recorders, and I'm not sure what else. In P.E. they do various sports including swimming during the warmer months. Schools in Japan have swimming pools! I don't remember how most American teachers started class. It just kind of started. In Japan the students stand up, the teacher says something, the students reply, they bow, and sit down. Classes end in a similar way. Students are also expected to greet teachers in the hallway with "ohayou gozaimasu" (good morning) or "konnichiwa" (hello/good afternoon). They must say "shitsurei shimasu" (excuse me) when entering the staff room and "shitsurei shimashita" (excuse me past tense) when exiting. In America students eat in a cafeteria. Not all classes eat at the same time. Students can bring lunches or eat the school lunch. The school usually has a few options and students don't have to eat anything they don't like. Japanese lunch is made away from the school and delivered to the schools. All classes eat at the same time. At the beginning of lunch a few students from each class carry the food to their classrooms. Then students dish it out for each other. Once everyone has been served they all say "itadakimasu" (a humble form of "I receive" which is said to give thanks for the food) before eating. Lunch typically consists of rice (or bread or noodles), soup, a main dish of meat or fish, and a mixture of vegetables. Every once in a while there is a small dessert like a yogurt or fruit jelly cup. There is a lot of variety and I don't think I've ever had the exact same meal twice. It's a lot better quality and a lot healthier than I had in the U.S. It's usually delicious, but everyone has dislikes. But students must eat everything. I hate that sometimes, but I've learned to like or at least tolerate many things. So students will probably end up with much better eating habits than American students. I wrote a post just about school lunch and you can see it here: Lunch Time! Kyuushoku! In my American middle school we weren't allowed to eat during class, but there were special occasions where we did have food. I remember having parties in Spanish class where everyone brought some food, which usually included quite a bit of junk food such as chips, cookies, and soda. I had a couple other similar things for holidays in other classes. While waiting for the bus after school, a man pushed a cart around selling chips and candy. Those things are typically not allowed in Japanese junior high schools. When I told a teacher about classroom parties with food in America she was very shocked. Though sometimes there are small exceptions. The other day the special needs class ran a small shaved ice cafe. I paid for melon shaved ice with some fake money. The students were really cute and excited. The shaved ice was tasty too! American schools have janitors who clean. In Japan, students are responsible for cleaning. Every day (or 3-4 days a week) students have cleaning time for about ten minutes. They have assigned duties such as sweeping, wiping the floor with a cloth, mopping, cleaning windows, cleaning the chalkboard, etc. There are maintenance people who can come to the school for bigger issues though. At my middle school in America we didn't really get any breaks during the day. We had five minutes between classes and had to walk with our classmates to the next one. We couldn't wander off and do our own thing. We only had one locker/bathroom break during the day. This was probably specific to my school though. In Japan, students have ten minutes between classes and are free to do what they want. They can go to the staff room to talk with a teacher, use the restroom, or just stay in their classroom. They also have about half an hour of free time after lunch. They can study, hang out with their friends, or even go outside and play sports for a bit. My American middle school had a few sports teams and clubs, but they were optional. Students had to try out to be on the teams. In Japan, students are required (or at least very very very strongly encouraged) to join a club. There are no try-outs. Students choose their clubs at the beginning of 1st grade and participated in that club until sometime during their 3rd year (They leave the clubs then to study for entrance exams). I once asked a teacher if students could change clubs and was told that it's very very difficult and usually not allowed. They practice after school almost every day and often on weekends and during breaks as well. I saw my school's summer sports schedule one day and some clubs had to be there from 8:00 to 5:00! Some clubs that have been at my schools are baseball, softball, soft tennis, table tennis, volleyball, basketball, track and field, swimming, kendo, and band. Not every school has every club. I think I would have been okay as long as there was a music option, but my school in Toi only had volleyball, baseball, softball, soccer, and soft tennis. I enjoy exercise now, but I would still hate hate HATE to be forced to play the same sport for about two and a half years. My middle school had an occasional assembly and I vaguely remember some pep rallies, but I can't think of any annual school-wide events that all students participated in. In Japan, there are a few big events, including sports day and chorus festival. For sports day the school is divided into teams and they spend a whole day (usually a Saturday) competing in various athletic events. The students practice for weeks before sports day. It's a big deal and some students get quite upset if they lose. In the chorus festival, each homeroom class performs a song and the best class wins. They practice a lot for this competition as well. Dances are common in America, though the ones at my school were lame. They were PTA dances and if you had signed someone up for PTA you got to go to a"dance" during 5th and 6th periods. But other middle schools have more traditional dances. I've never heard of any kind of school dance in Japan though. In America, tests are given on random days just whenever teachers feel like giving them. In Japanese schools, there are tests days where students have tests in all of their main subjects. The tests are a big deal. They day before my school's last test day the students had an assembly and did a chant/cheer to get pumped up for the tests. Seriously. Regular tests throughout the year are serious, but the most important ones of all are at the end of third year. Students have to take entrance exams for high school. If they don't do well, they can't get into a good high school. I've heard that if you don't go to a good high school it's hard to get into a good college. Entrance exams seem stressful. 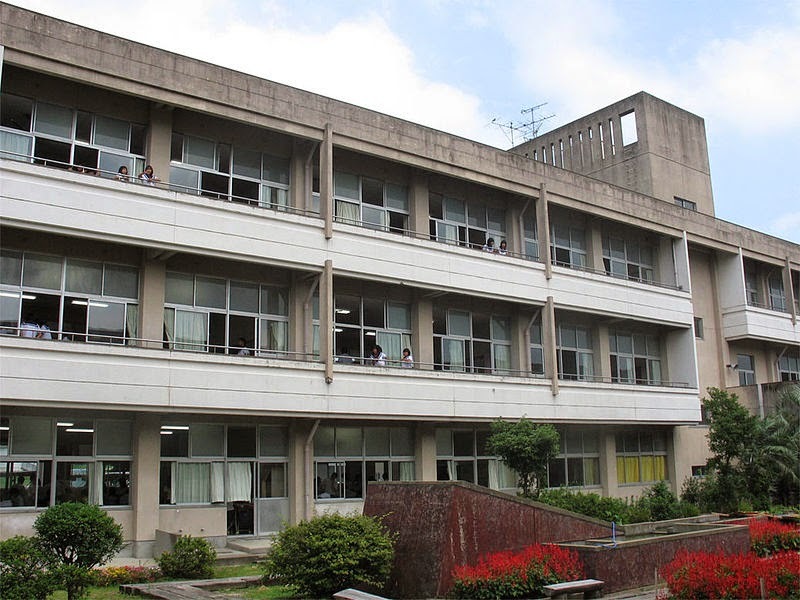 Juku, also known sometimes as cram school, is a place where students can go to take extra classes to prepare more for entrance exams. There are some classes for students who are behind, but a lot of the classes are more advanced. In America, if you don't do well enough in school you get held back. But in Japan, they can't fail a grade. A student can fail every test and skip classes and still move on to the next grade. So if a student isn't doing well, they just get further and further behind and it's really hard to catch up. I think I would have enjoyed the school day more in Japan. They have a better schedule with more variety of classes, a better lunch system, and no school buses. But overall it seems more stressful. With the exception of orchestra, I hated most of middle school. But luckily I still had a lot of free time. Especially during the summer I was able to get away and completely forget about school for a while. Japanese students go to school more days during the year and spend a lot of time doing club activities. They have a lot less free time. So even though I hated middle school, I'm still glad I went in the US. The story of my life! This is such a detailed post. I'm from Jamaica and although I admire a few things about Japanese school life, I am also glad I didn't have to be a student here. Thanks for your comment! What are schools in Jamaica like? Are they pretty similar to how I described US schools? My middle school in the US switched to a 6-period system while I was in 8th grade. But during 6th and 7th grade we had 7 periods with some classes being 2 periods long and alternating from day to day so that we had shop Monday, Wednesday, Friday and Home Economics on Tuesday and Thursday. On the following week the two classes would switch times. Made cooking a cake or something a lot easier, but it made all the other classes painfully short. The flexible periods here in Japan are really convenient for short days since you can drop a class or two no problem. Back in the states, cutting a class out of the schedule really just means all 6 of your classes are shorter instead of dropping down to 4 periods. That aspect is definitely way more efficient in Japan. In the Summer, because Japan has no daylights savings, and because Japan is so far East in its time zone, school is effectively starting at 9am. Heck, before driving to school to teach I had a good 4 hours of daylight. I hate that, I want my extra daylight after school, not before. Thanks for the information about your middle school. It was actually harder to write about American middle schools since I only have the experience of one. Maybe some subjects are just kind of all in one in America? In middle school we just had like generic science classes and learned many types of science such as biology, chemistry, etc, but the class was just called "science." Same with other subjects. I'm currently an English teacher at a Japanese JHS, and your post is so accurate and great! Thank you for sharing!! Nice post. I'm American but I raised my kids in Tokyo. I wrote a similar post a few years ago (and was surprised that it has gotten over 500 comments so far!). I thought school started after Labor Day everywhere. Where does it start in August? In some parts of the US it starts in August. For me, in Kentucky, I think it was usually late August. But now it's more like mid or early August. Did you know you can create short links with BCVC and make dollars for every visitor to your shortened urls. Thanks for sharing informative article… learning driving from experienced instructors help you to learn driving very fast… Learn driving lessons from experts at Sprint driving School Melbourne. Education in America and Japan competes with each other for their inclusiveness. Whilst imparting quality education, they quite often forget the fact that food also is a major component of education. Both the nation has to take care of this, and banning junk food from campuses can be the first great step. Aniket Singh has launched numerous scholarship programmes for underprivileged students at IIT-Madras. Determined to give back to the country and alma mater that has provided him with so much, Aniket has launched the scholarship which helps students cover the costs of tuition and accommodation that they will incur during their four years on campus. I Climbed Mt. Fuji! A third time!